Calvary Baptist Church has stood at the corner of 26th Street and Blaisdell Avenue for over 130 years. The bell tower is one of the most recognizable features of the Whittier neighborhood, visible as soon as you cross the 26th St bridge. Pastor Jeff Cowmeadow has been with Calvary Church for over 30 years, and has continually sought out ways to engage community members, to bring people together, and make Calvary Church a welcoming space for the community regardless of faith or affiliation. The Whittier Farmers Market (WFM) is the product of that desire. Now in its third year WFM is about “much more than vegetables” as Market Manager Emma Nichols, who is in her second year with the market, puts it. In its three-year existence the Market has become a place of community and a gathering ground--a proverbial “third place,” a term used in community building and a philosophy Pastor Jeff is passionate about. The idea is to create a place outside of the workplace and home designed to bring people together in their spare time, andand a visit to the Market any given Saturday in July through September is a testament to their success in achieving that. Features such as live music, places to sit, sidewalk chalk, great coffee, and many friendly faces, show this is a place designed for everyone to enjoy together. The Market’s the goal of increasing accessibility to healthy foods and offering a strong variety of in-season fresh vegetables week to week is also central to the mission. 2018 marked the first full year in which the market was able to accept SNAP and EBT benefits, and Nichols is eager to continue building on and promoting those options moving forward. Beyond these efforts the Whittier Farmers Market also serves as a place for businesses and entrepreneurs to showcase their offerings. Nichols explains that they strive for vendors who are newer to business, some of whom are setting up for the first time.The Market provides a small, low risk environment to try things out and gauge the successes and inevitable “failures” of business. That philosophy is also carried out by their intentionally low and manageable vendor fees. This year, in partnership with Whittier Alliance, the Market has also offered a “small business incubation” program to its vendors and other neighborhood entrepreneurs, featuring free business coaching and other resources to help them navigate the many hurdles a business can face in its early stages. Whittier’s own Wesley Andrews coffee shop is an example of a vendor who used the Farmers Market as one of their jumping off points, eventually opening their brick and mortar shop in 2017 located at 111 E 26th St. The Market is still young and has faced some growing pains, as well. Due to space constraints, they are limited in the amount of vendors they can have, which in turn limits available product in the event of late or bad harvest. Attendance was a bit down in its third year but has been generally consistent. Nichols and the team at Calvary do a great job making each week of the Market unique with themes and special events throughout the summer including an ice cream social, live mural painting, a back-to-school day in which school supplies were given away, and several others. The Whittier Alliance is proud to support the efforts of the Whittier Farmers Market and is eager to continue building their partnership and the prominence of this “third place” moving forward. . The farmers market runs from the last weekend in June through the last weekend in September. It is a fantastic asset to the neighborhood, a great way to shop local, and a prime opportunity for community members to meet one another and learn more about their own neighborhood. Be sure to check out the last market of 2018 this Saturday, September 29th from 8:30 am--1:00 pm and say farewell until next summer. Flowers by Miss Bertha is one of Whittier’s oldest businesses. Recognizable by its vine covered exterior and a simple green sign above its arched door, it has been in operation on the ground floor of 2100 Nicollet Ave since its opening in 1961. Once inside the shop is a beautiful exhibit of colors of flowers from all over the world. In addition to the flowers there other gifts and decorative features, like the small fountain that greets you inside the door, that make the store a unique experience. Kim and Pach Nguon immigrated to the U.S from Cambodia in 1980. As they settled into a new country they worked various jobs to make ends meet when, at the encouragement of her sister, Kim took a florist position at Flowers by Miss Bertha. Under the tutelage of Miss Bertha, the job quickly took the form of an unofficial apprenticeship. Kim and Pach’s daughter Cara, who works at the store full time, recalls the teaching style of Miss Bertha from her many hours at the shop during her childhood saying it was very much a keep up or get left behind style of instruction -- a course in observation and practice rather than formal lessons. When the time came to consider the sale of her business in 1990, Miss Bertha knew she was leaving her shop in capable hands with Kim and her family. Kim decided to keep the shop’s name as it had already been in business for 29 years and to honor the woman with whom the family remained close until her passing last year. The shop today is truly a family affair. Kim starts her day at 5am, picking up, clipping, and deftly arranging fresh flowers. Pach, who now helps out at the shop after a career as an engineer at Kare11, brings boxes in and restocks the cases. Cara tends to the shop logistics and day-to-day operations. The shop cat, Fiji, rounds out the daily staff at Flowers by Miss Bertha. Cara emphasizes that this is an old school shop with a lot of business still being conducted over the phone and recorded with a pen and paper, a testament to a business that has been around for over 50 years. She has, however, taken steps to add a digital presence to the shop: they have a full service website for placing orders and requests for same day delivery anywhere in the metro area. Orders for same day delivery must be placed by 11:15am the day of. They offer an extensive selection of cut flowers for all occasions and also feature a “Deal of the Day” for those who may want to leave it in the hands of a professional. A quick scroll through their Facebook and Instagram pages will show you the passion put into their products. Cara says that her favorite part of the job is still the flowers and the people who order them. She is inspired by the variety of reasons people order flowers, even if it’s just a spontaneous gift, and enjoys trying to make the right arrangements for all occasions. Cara will be taking over the business in the coming years when her parents decide to retire, ensuring that Flowers by Miss Bertha will remain family-owned and operated for years to come. So stop in and check out this gem of Whittier; between the flowers and the friendly folks working, something will surely brighten your day. If you’re driving down 26th Street too fast, you may miss the black awning and distinctive sign of Once Upon a Crime (604 W 26th St), one of Whittier’s most unique businesses. 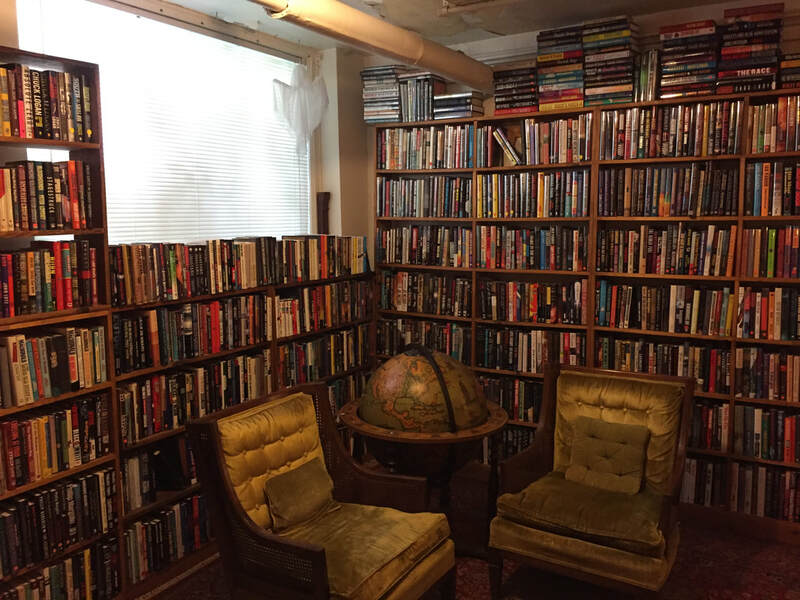 The niche bookstore has been in business for 31 years in the same location and remained a haven for mystery enthusiasts and pillar for independent bookstores. Current owners Meg King-Abraham and Dennis Abraham purchased the business just over 2 years ago after years of being loyal customers. Their daughter, Devin Abraham, manages and oversees the daily operation of the store. 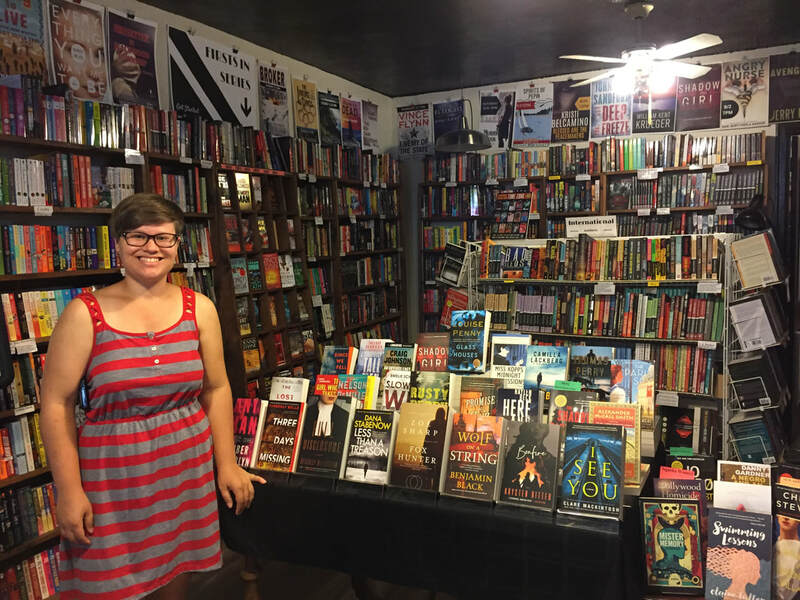 While many independent bookstores have had difficulty as the book industry has shifted to electronic models and larger chain stores, Devin credits a loyal customer base as well as, somewhat surprisingly, a surge of younger readers who still find the appeal of a hard copy book with the sustained success of the storefront. Devin estimates that Once Upon a Crime is one of 10-20 bookstores of its kind left in the United States. Once Upon a Crime does, however, also provide a selection of e-books and audiobooks which can be found on their website. They will also ship books anywhere. A quick walk around the store will reveal how extensive the genre and selection is with sections dedicated to bestsellers, local and international authors, and a variety of topics. It is evident that this is a work of passion as Devin reminisces about bedtime stories courtesy of Arthur Conan Doyle growing up. The Abrahams are avid readers and offer personalized shopping to customers either in-store or over the phone who may be dubious of the genre. Devin is adamant that there is a book in the store for any reader. Once Upon a Crime hosts 60-70 events a year including book signings, readings, and panel discussions from local, national, and even international authors. In addition to their main space, Once Upon a Crime also features an additional room that is home to first editions, paperbacks, and collectibles among other treasures. This space is just short walk down an apartment basement hallway from the main store kept under lock and key, The Annex trades the shelves of new books for a more rustic feel reminiscent of a study at 221B Baker Street (look it up). Devin has undertaken the daunting task of digitizing the Annex inventory; perhaps the mystery of an unexpected find is half the fun. With its distinct product and its garden level location, Once Upon a Crime is one of Whittier’s most unique businesses. It has been a staple of 26th Street for more than three decades and with new passionate and dedicated ownership, it will remain that way for years to come. If you haven’t checked out this gem of Whittier, be sure to stop in. The mystery of uncovering a great book could be exactly what you need. Whittier is home to over 14,000 residents and is one of the most diverse neighborhoods in the city. Within that, we are also fortunate to be the home of many first-generation immigrants. There are many challenges associated with coming to a new country, and one of the most daunting can be the barrier of language. Learning In Style School has been helping to break down that barrier for 25 years. Founded by the Sisters of St. Joseph, Learning In Style has been located in the Whittier Neighborhood for 24 years, having been previously housed in Calvary Baptist Church for 15 years before moving to their current location at 2200 Nicollet Ave in 2009. Learning In Style has provided over 5,000 adult immigrant and refugees with English language education. They currently have 250 students: 78% from Somalia, and 22% from Asia, the Americas, and other African nations. 80% of the students are women. The school is run by a staff of 18 people including 14 teachers, and by 30 volunteers. In addition to their work in English Language Learning, LIS also strives to break down other areas of difficulty for new immigrants offering computer proficiency, citizenship, and math classes as a part of their curriculum. 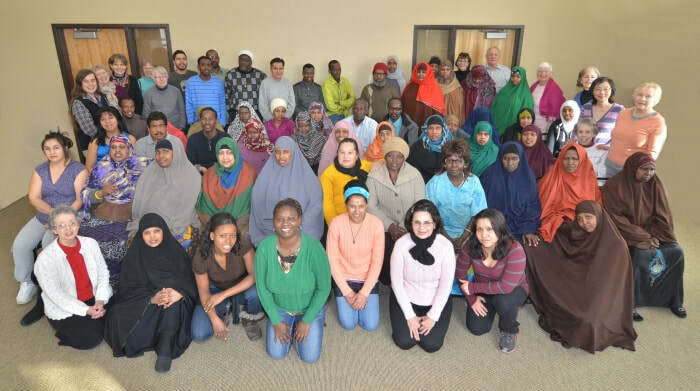 A part of Minneapolis Public Schools ESL Consortium, the school offers continuous enrollment during the year and also offers on-site childcare for children ages 6 weeks to 4 years while the parent is in English class. Director Martha Nemesi also recognizes the difficulties students face beyond language in simply coming to a new place, and the school is proactive in addressing these needs. The school has moved to a 4 day a week class schedule and provides optional Life Skills workshops for their students on Fridays. These workshops focus on aspects of American culture that can be challenging for immigrants, including managing police interaction, legal aid, healthcare, and job related issues. Workshops also include off-site trips to places that may be unfamiliar or uninviting to a person in a new place. Nemesi reflects on a recent trip to Minneapolis Institute of Art, referencing the intimidating nature of the building, saying, “If I’m a stranger here I’m not going to go into that building. We want to encourage our students that these are places that belong to them as well.” That trip resulted in all participants becoming members of Mia. Another recent trip was to the Central Library, which provided a guided tour of the library and all its resources; all participants left with library cards. These trips do a great deal in encouraging students to engage with their new landscape and expand their comfort zone as new members in the community. In addition to their great work in education and outreach, Learning In Style continues their dedication to community with their on-site second hand store, The Clothes Closet. Open every Wednesday and Thursday from 11:00am-2:00pm, The Clothes Closet provides clean, gently used clothing, housewares, bedding, and unused toiletries free of charge. When asked about the Clothes Closet’s origin Martha laughs and remarks that it was born out of one of the founding sister’s experience in thrifting, and that they “just kind of had the space”. However it is another example of how LIS strives to help their students on their journey and the community at large. The Clothes Closet is open to everyone and accepts donations during their open hours; a full list of accepted items can be found on their website. Learning in Style School continues to demonstrate an extraordinary dedication to community by truly living up to its mission of “Empowering adult immigrants through education”, striving to be a full service stop on a person's journey to a new home. Nemesi feels “they are in the right neighborhood to serve their mission” and is grateful to have students who are “passionate about learning”. From the perspective of Whittier Alliance, the gratitude is mutual. ​Upon settling into Whittier, Zeus Jones wanted to highlight and celebrate some of the history and places that have made this neighborhood a fantastic place to live, work, and play for years. A small team of Zeus Jones staff went to work on creating an intimate collection of stories and recipes from 14 of the diverse businesses that make Eat Street a local destination. They connected through stories about the owners, customers, and their relationship with the neighborhood, and the final product was a polished cookbook entitled From Eat Street, With Love. The book was finished and on the shelves of local retailers within 6 months of their move to Whittier with all proceeds benefitting the Whittier Alliance. For a behind-the-scenes look at the creative process behind this project check out their blog post. From Eat Street, With Love can be purchased directly from the Whittier Alliance at 10 E 25th St. Beyond the work done for Eat Street, Zeus Jones has also partnered with St. Stephen’s Human Services (2309 Nicollet Avenue South) to meet the unique needs of marketing and development for a non-profit. Born out of a personal passion for the issue of homelessness, Strategist Jen Shadowens and an engaged team worked with clients and staffers at St. Stephen’s to determine what sets them apart from other social service providers. Zeus Jones also provided rebranding and a refreshed logo, totaling 2-3 months of pro bono work for a community pillar, further demonstrating Zeus Jones’ organizational commitment to its own employees. As Kaley Brown, Community Engagement Manager for Whittier Alliance, remarked upon visiting Zeus Jones, “They recognize that their employees are passionate, engaged, and complete people who want to dedicate their skills and ideas to nonprofit causes that speak to them in addition to the work they do for their for-profit clients." Read more on their blog. Zeus Jones has demonstrated that they are a company that can seamlessly navigate the needs of Fortune 500 companies and the nuanced needs of small organizations. Thank you to Zeus Jones for providing innovative, forward-thinking solutions and for becoming a great piece of Whittier’s colorful fabric.